Develop your leadership skills for ministry or business. Prepare to counsel effectively in today’s world. Prepare for the ministry or develop your spiritual life. Provides an excellent knowledge of the Word of God. 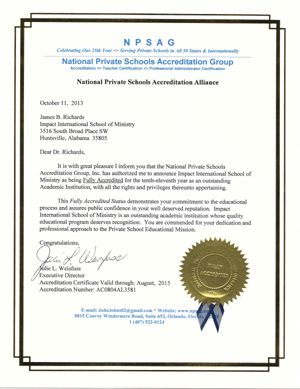 Dr. Richards has been training leaders all over the world for more than thirty years. Our students are successfully pioneering churches, going to the mission field, starting schools, and becoming effective in every area of ministry. Our program is designed to help you build and develop the skills to be a success in whatever area of ministry or business that you feel called to. By establishing yourself with a strong Bible-based sense of self-worth and a heart that is grounded in the grace, peace, and love of God, you will graduate with the confidence and skills to accomplish all of your life goals! 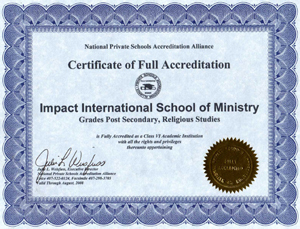 If you are looking for a course of study to help you accomplish everything you dream or if you are interested in establishing yourself with self-worth based on God’s love, Impact International School of Ministry is the program for You!